Syrian ceasefire 'test for everyone' Jump to media player Russia's deputy foreign minister Mikhail Bogdanov spoke to the BBC about the ceasefire plan for Syria, drawn up by Russia and the US earlier this week. Syria ceasefire: Aleppo district 'pulverised' Jump to media player Two days into a ceasefire in Syria, the BBC's Jeremy Bowen reports from a "pulverised" neighbourhood in west Aleppo, which was once held by Syrian rebels. A step closer to peace? Jump to media player Russia and the US have announced an agreement on Syria aiming to reduce the violence. Aleppo: Syria's key battleground Jump to media player Aleppo was once Syria's largest city and the country's industrial and financial centre, but since 2012 it has been a key battleground in the country's civil war. The ceasefire plan for Syria, drawn up by Russia and the US, is 'a real test for everyone' involved, according to Moscow. 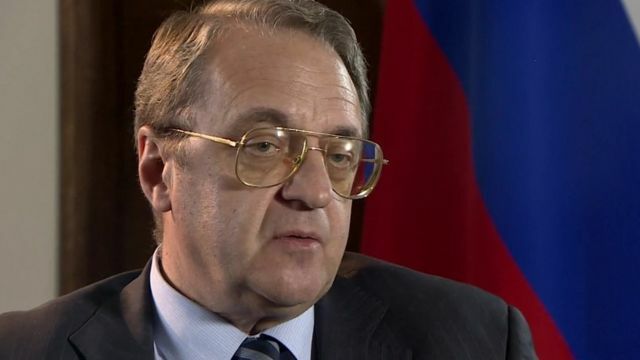 In a rare interview with the foreign press, deputy foreign minister Mikhail Bogdanov told the BBC that Russia expected no violations by the Syrian government. However, he warned that the US needed to use its influence with moderate opposition forces, to ensure that they separate themselves from groups linked to al-Qaeda. The BBC's Sarah Rainsford spoke to Mr Bogdanov in Moscow.